This may come as a surprise, but flight attendants’ day-to-day lives differ wildly. There are sixteen crew member long-haul trips, small low-cost carrier airlines, and then there are single flight attendant regional “puddle jumper” flights. What your job looks like all depends on the size of your airline, aircraft type and aviation laws of whichever country you are based. So far, we’ve taken you inside the life of a 787 Dreamliner Flight Attendant, now we welcome you to walk a mile in the high heels (err, Danskos, in this case!) of a regional reserve flight attendant. 9:36am: I am on the light rail going towards the airport, feeling like a hot mess when I finally decide to check my schedule to see where I am going. My trip sheet pops up. TDY to San Francisco, four-day trip, overnights in Austin, Phoenix and Los Angeles. YES! Noon: Made it to my deadhead flight from SEA-SFO, found my next gate and am now meeting my crew and pre-flighting the aircraft. My new crew is a German captain who grew up in Mexico City, a First Officer from Paris and a curly-haired flight attendant from Brazil. We are already discussing getting BBQ in Austin tonight and I know this is going to be a rad trip. The aircraft is another story. It is a Canadair Regional Jet 700, a medium-sized 70-passenger plane that has a few quirks. As I am pre-flighting my emergency equipment a panel falls down on my head. I tape it up with a few bandaids and pray that it holds when the passengers are onboard. (SPOILER ALERT: it doesn’t.) The other flight attendant and I rush to make coffee in the one coffee pot that works, make sure the airplane is clean (us regional FAs clean our own planes, how about that?!) and discuss our announcements. Working as a regional airline crew member means representing a different brand every day. Some days we fly as Delta Connection, other days it is US Airways Express or American Eagle. I usually fly as Alaska SkyWest, but today’s trip has me doing announcements as United Express. I repeat the airline over and over in my head, hoping I don’t say the wrong airline like I did last week. Whoops. 12:15pm: Boarding has begun. I am the Aft Flight Attendant, so I stand in the rear of the aircraft, directing folks to their seats, giving individual briefings to Unaccompanied Minors, hearing- and vision-impaired customers and telling passengers when their giant bags won’t fit in the tiny overhead bins. They never believe me. 12:35pm: The last five minutes of boarding are always a rush of closing bins, handing oversized items to the ramp agents to put under the plane, giving the Pretaxi announcement, briefing the exit row occupants, completing the passenger count, conferring with the customer service agent and finally, closing the main cabin door. We hold our breath as we ask the Captain if we are on time. He gives us a thumbs up and we exhale. The Forward Flight Attendant gives the Main Cabin Door closed announcement and I check passengers for compliance. Once I reach the rear of the aircraft I give the Forward FA a thumbs up and she shuts the flight deck door, telling the pilots that “we are ready to taxi.” I sit in my jumpseat and begin my Predeparture announcement while the Forward FA does a demonstrates the use of the oxygen masks, seatbelts and points at various signs and placards. We finish the safety demo by walking up and down the aisles, checking everyone’s seatbelts, carry-on items and answering questions. The Forward FA adjusts the cabin lighting to match the outside conditions. Finally, we walk up to the front galley, breathe a little sigh of relief before realizing that we have to do this two more times today. Such is life as a regional flight attendant. 12:47pm: We taxi around SFO for a little while before getting in line for take-off. Our Captain asks us to take our seats and we do, buckling up. The Forward flight attendant gets a call from the flight deck and she answers it, stating, “Cabin secure.” As the jet speeds up for take-off, us flight attendants take our brace positions which makes it look as though we are either praying or sleeping, depending on which way we are facing. My jumpseat slides out for use in front of the lavatory door entrance, right in the middle of the aisle. The passenger to my right is holding an infant, who pokes me in the eye as my head is lowered for take-off. I decide to review safety procedures for babies, reminding myself where the infant life vests are and how to administer oxygen to a baby. 12:52pm: Five minutes after take-off, we get two low chimes, indicating that we have reached 10,000 feet. I make service announcements and remind passengers that the seatbelt sign is still on. The Forward FA starts her First Class service while I set up the Economy Cabin beverage cart. I roll the cart out to through the cabin and begin offering little plastic cups of soda, juice and water to folks. 3:29: Two low chimes indicate that we are going below 10,000 feet and we should prepare the cabin for landing. I make the Prelanding announcement and walk through the aisles collecting trash and recycling. We dump all the old coffee in water bottles and consolidate all of our trash. I walk through the aisles one last time, reminding people to buckle up, slow their carry-on items and put their seat backs in the upright positions. The high-low chime sounds and then I hear the rush of the landing gear come down as I take my jumpseat. The Forward FA adjusts the lighting again and we take our brace positions once more. 3:53pm: We land with a little bump and taxi around Austin-Bergstrom Airport for a while. I make my Welcome To announcement and watch to make sure people don’t unbuckle their seatbelts or open the overhead bins. Finally at the gate, passengers fling their seatbelts off as soon as they are allowed and rush towards the front of the plane. The Forward FA opens the Main Cabin Door and while the customer service agent drives the jet bridge over for passengers to deplane. 4:04pm: The last passenger has deplaned and us crew members rush to clean the plane. Think being a flight attendant is all glamour? Try telling that to a regional FA, as she is crawling around her little jet, scraping a sticky substance off of the floor with a plastic knife and some cleaning solution! After checking seatback pockets, giving the lav a quick once-over and crossing all seventy seat belts, we are ready to board again. SFO-AUS. AUS-IAH. IAH-AUS. We land, clean, board again, go through all the safety procedures and announcements. We are lucky that we get to keep the same aircraft all day; it is common for us to switch planes on every stop. Our little jet gets a little dirtier throughout the day and the sloppy panel fix is threatening to fall down. Us flight attendants are looking a little worse for the wear as well, and I can’t remember the last time I’ve eaten. 7:49pm: We land back in Austin for the night and deplane. I try to keep smiling as I thank passengers for flying with us, but I think my lipstick might be smeared on my teeth and possibly parts of my face. I probably look like a sad, tired clown. The plane is headed out once more tonight with another crew, so we wearily cross seat belts for the last time and I run a little carpet sweeper down the aisle, hoping to leave the next crew with somewhat of a clean plane. 8:12pm: Our little crew of four walks out of the airport to wait on the hotel van. 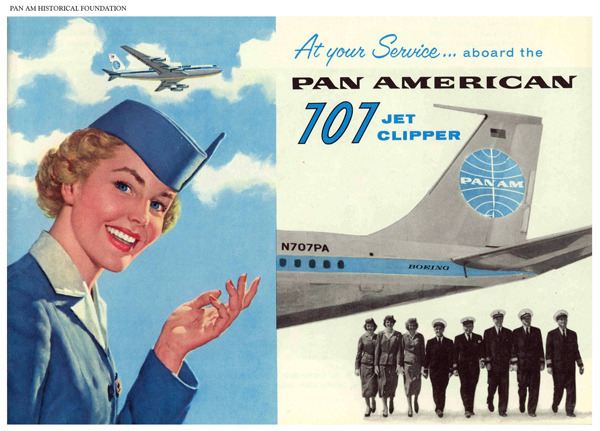 Far from the Pan Am ads, we look more like we just survived a hurricane. I still have something gum-like stuck on my skirt and the other flight attendant has a coffee stain down the front of her blouse. The pilots have been downing black coffee all day and look shaky and dehydrated. We wait outside on the curb for a little while before our shuttle van pulls up. No one mentions going out tonight. We’re too tired. 8:35pm: We arrive at the hotel. It is on the outskirts of town, close to the airport. I was hoping for something downtown, so I could go out and explore, but this will have to do. My room is clean and adequate, with a view of the parking lot. The sun is setting. I flip on the TV and listen to the news reporter’s Texas accent. I turn off the Air Conditioning and open the window, letting the sticky breeze touch my skin. Then I have an idea. 9:01pm, end of Day One, AUS: It is dark, but still warm. I am sitting by the empty pool, listening to the noises of the airport across the street. I lower the back rest of my lounge chair and lay down flat. I sip on the cold pop I got from the vending machine and sigh. Suddenly, a jet appears across the sky, taking off for who-knows-where. I watch it streak across the sky like a meteor, listening to the roar of the engines as it disappears. I take another sip of my pop and wrap my pool towel around me like a blanket. And I wait for another plane to take-off. Keep up with Celessa over at TheEverydayJumpseater.com and on Instagram at @TheEverydayJumpseater! When you work for a regional airline, what type of travel benefits do you get? Sorry for the delayed reply. So, when working for any airline, your flight benefits vary greatly. For many regional airlines who operate as “feeder” airlines (meaning that they contract with larger airlines and fly as a representation of the brand, i.e. : United Express or Delta Connection), flight attendants receive flight benefits with whatever larger airlines they contract with. For me, my regional airline contracts with United, Delta, US Airways, American and Alaska, so I have flight benefits for myself AND my family through all five big airlines, plus I can jumpseat or purchase ID90 (discounted tickets) on dozens of airlines that have agreements with my company. In the end, some regional flight attendants actually have BETTER flight benefits than mainline FAs! So, research your airlines and ask around to figure out what airline will work for you. Again, it all depends on what you want out of this job 🙂 Hope this helps!